Empowerment Moments Blog: The Best Is Yet To Come! Life's detours don't mean that your story has ended, it simply means that the Author and finisher of your faith had to change the "set" for the new scene of your life to take place! It means also that you've got to learn and understand when someone's season in your life is over to let them go! You cannot keep folks in your life whose role in it has ended. Time for the set to change, time for the background colours to change so that the new set director will take you into your next season. 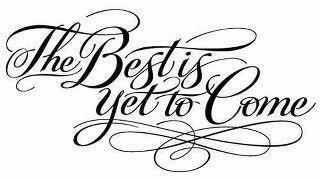 Your best is yet to come!